HAASS: Sitting to my immediate left, as you heard before, is Maurice Fitzpatrick who directed and produced this film about John Hume and the early decades of the peace process. To his left is George Mitchell. And George Mitchell is living evidence that the Nobel Peace Prize Committee continually gets it wrong. (Laughter.) He should have gotten one-third of that prize, in my humble opinion. And I was lucky enough to succeed George in this role. And while I didn’t work in this phase, I’ve had a little bit of experience subsequently with John Hume and more broadly with Northern Ireland. So let’s talk about—we’re going to talk a little bit about this chronologically, but I want to start with some of the basics. So I’ll start with Maurice and George. Why did we finally get an agreement in 1998? What were the—you know, I’ve learned that peace is never inevitable or peace deals are not inevitable, and we’ll make a distinction here because it wasn’t quite peace. Why did it finally happen in 1998 and not before and not after? Why did it happen then? FITZPATRICK: I think it’s true that both peace is not inevitable and neither is war inevitable. I think when people in the late ’60s, early ’70s in Northern Ireland tried to reform the society they were faced with—the volume is OK here, you can hear me OK? Yeah? HAASS: I hear you fine. FITZPATRICK: They did manage to put together some very clearheaded and in fact prescient proposals for a new society. What I think was lacking at that point was the will to consolidate those interceders, particularly in London. On the part of Dublin, Dublin was still coming to terms with the fact that the Northern Irish state, which had, from one point of view, had been rather quiet and muted for half a century and now suddenly its problems emerged in a very public way and an unavoidable way, so the kinds of proposals being put forward by John Hume and others did make a great deal of sense and do have very clear parallels to the kind of deal that inevitably and that eventually was brokered. But it was also true that you had the legacy of historical wrongs and a great deal of bitterness and division. And it’s probably difficult, when you consider Northern Ireland in the late ’60s, the early ’70s, difficult to imagine how all sides could have come around to the table and acted constitutionally, even if that was where the north went in the end. HAASS: George, turning to you. And five seconds, just also want to say Jonathan Powell was meant to be with us, who was Tony Blair’s wingman for many years during this process, he came down with a bad flu and was barred from travel by his doctor. That’s why there’s three of us up here, not four. Mr. Ambassador, Senator, your sense of why things finally came together in the late ’90s and not before, not after. MITCHELL: Sometimes when you’re in the eye of the hurricane you’re so preoccupied with survival that you don’t really see the larger picture, and so I’m not sure I had the best perspective in that. It was an incredibly difficult struggle just to keep the talks alive, to keep the process going. In retrospect, and I think it will take time for the judgment of history to coalesce, there were several factors, and I’ll enumerate just a few that I’ve come to believe played a role. The first was the creation of the European Union in which the governments of the United Kingdom and Ireland, which had been until then deeply hostile, a cold, negative relationship, was transformed over time by their both beginning to work together and be part of a larger enterprise, the courage of political leaders who took what in retrospect seem like small steps, but were very difficult steps at the time, the Anglo-Irish Agreement, other steps taken to move the process forward. And the conclusion by the two governments that if there was to be any chance to end this historic conflict, there had to be a cooperative effort by the two governments themselves, they had to join in laying the foundation. Third, they learned from past mistakes. Things which are so obvious in retrospect aren’t clear at the time. Several prior efforts had failed. The one just prior to the one in which I was engaged had failed badly. And the governments conducted an inquiry to try to figure out why it had failed, and they reached a conclusion after much study, which will, to you, seem so obvious that it wouldn’t have taken five minutes for a high school kid to figure it out. The prior negotiations involved only what are called the constitutional parties in Northern Ireland. That’s highfalutin language to say those parties that did not have affiliated paramilitary organizations. They excluded the parties affiliated with paramilitaries, even though the paramilitaries were fighting the conflict. So they reached the tremendous conclusion that if you want to end a war you can’t exclude the people who are fighting the war from the discussions. In fact, Richard, that was, as you well know, one of the most difficult aspects of getting the process started. And the first assignment I had when asked by the governments was to conduct an inquiry and make recommendations on how to overcome what seemed like the insurmountable obstacle of the British government and the unionists demanding that the paramilitaries had to surrender their weapons prior to the beginning of any talks and the paramilitaries on both sides refusing. And I and my colleagues came up with a way around that. A fourth factor, the entry of women into the political process to a degree that had not previously existed. Northern Ireland is a very conservative, traditional society, but over time, women saw the need to enter because of the enormous human loss, cost and, most of all, the anxiety and fear. When the conflict began, as Maurice will know well because he’s from Northern Ireland, and some of you know the issue very well, the paramilitaries adopted policies of limiting their attacks to, quote, “military targets.” Now, they defined military in a way that we would not. To the IRA, it was British army and Northern Ireland police officials. But as in all wars, the longer it went on, the more savage it became, the restraints fell away, and between 1970 and 1995, it became pretty much open killing of anybody who happened to be in the wrong place at the wrong time. And we’ve lived through wars here that occurred in distant places and we know where the battle lines are, but we don’t worry that we step out our door or when our kids go to school they may be struck by a bullet or hit by a bomb. And the anxiety level grew very high and women became more and more active and involved. And I think that did play a significant role in changing the attitude of society. And finally, I would say, while it’s common in democracies, including our own, for people to hold in contempt and ridicule public officials, and Lord knows, as we see now this, it’s earned and deserved—(laughter)—but yet there are moments in history when ordinary men and women rise to the occasion with courage and vision. A lot of people deserve a lot of credit, but the real heroes of this agreement that you’ve heard described tonight were the political leaders and the people of Northern Ireland. These political leaders had been in conflict for a half century. In the negotiations that we had, several of the participants had been shot, wounded in bombings. Several of them had participated in criminal acts for which they served lengthy prison terms. During the negotiations, two of the delegates were assassinated, shot to death. They all lived under a heavy overlay of violence and a threat of violence, and yet, in the most improbable of circumstances, they had the courage and the vision to rise to the occasion and take steps that for some of them ended their careers instantly, for almost all of them adversely affected their personal and political fortunes, placed their families at risk. But they did the right thing. And think about it, this is the equivalent of a state legislature here or provincial government, just ordinary people. They had spent their entire lives in conflict, and yet they came together at a critical moment and we succeeded by about that much of a margin. HAASS: I want to come back to two factors that you didn’t explicitly mention, so I want to raise them as factors. One is, Nelson Mandela was lucky to have F.W. de Klerk. Mandela could not have made peace by himself in South Africa, he needed a partner. And John Hume had David Trimble who is, shall we say, quite different than the Reverend Ian Paisley. So one is, to what extent—and they’ve shared the peace prize. One doesn’t hear as much about Trimble. But it seems to me that one factor is whether John Hume could have done this without a partner. The second question, who are the bad guys in this movie? But I would suggest get unfairly treated a bit are the Brits, because it seems to me the Brits did two things here that were important. One is, by using force for decades, however badly at times they used it, they also managed to demonstrate to the provisional IRA that they could not shoot their way to power, and that ultimately there would have to be a political path to power-sharing, the gun was not going to get you there. 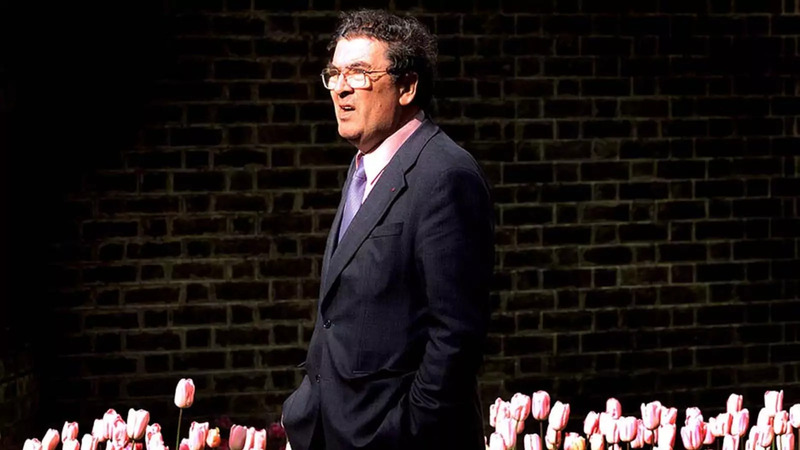 And then particularly under Margaret Thatcher, of all people, surprisingly, they did open a political path with the Anglo-Irish Agreement, which is no way of saying John Hume gets the lion’s share of the credit, but in the larger sense, and this is not taking anything away from him, but he had partners on both the unionist side and the British side. How about that? MITCHELL: Well, when the Nobel Prize was announced, thank you for your kind words, but what I said was that there would not have been a peace process without John Hume’s vision and courage and there would not have been a peace agreement without David Trimble’s courage. And they both suffered grievously for their actions. Trimble’s career ended almost instantly. Hume’s party went into a steep decline from which it to this day has never recovered. I share your thoughts on the British government and I will be much more specific. I think a man who has received much less credit than he deserved was John Major. The parliamentary system is very difficult, it’s very different from our republican form of government. A prime minister who has a large parliamentary majority has far more power than any American president ever had or will have in terms of his office or her office. But a prime minister with a tiny majority is hamstrung in a way that no president could be hamstrung. Tony Blair had a majority of 180. He had a completely free hand to do and say whatever he wanted. John Major, when he ended his term, had a parliamentary majority of two and there were a dozen unionist members of parliament. So rather than he having leverage over them, they had leverage over him, and yet he took step after step in defiance of their position, in defiance of many in his party by getting this process going. One was to get the United States involved and to get me involved. I had a member of the British parliament ask me in anger, when Major said he was going to ask me to become involved, a member of parliament asked me, if Texas decides to secede again from the United States, will you invite a Brit over to resolve it? There was tremendous resentment by the British over American involvement, in part because it was what the Irish wanted. And, of course, if you’re hostile, whatever the other guy wants, you’re against automatically, whether it helps or not. So you’re a hundred percent right in your assessment of the fact that there’s a lot to go around. And I’ll say one other thing about both governments. First, they both had very skillful, able civil servants working on this, men and women who had spent their careers trying to keep this process under control, who were brilliant in helping to devise remedies to get around the daily hurdles that we had to try to keep this process going. And in both countries, it was not an internal political issue. Neither party in the United Kingdom of the three parties and none of the parties in Ireland tried to make political hay out of the failure of the government to get an agreement. They were supportive and it was relatively seamless when the control of government changed hands in maintaining a consistent policy. To an extent that I think would shock Americans, they held the national interest higher than their partisan interest with respect to this issue. HAASS: Maurice, I want to come back to what I felt was one of the most poignant moments in the documentary. And I think it was Bill Clinton talking about John Hume and essentially sowing the seeds of his own political demise, and it actually happened on my watch, and you had the election in which on both sides, the parties from the wings replaced the parties from the center, both on the unionist side and on the republican nationalist side. And the question I have for you is, was John Hume aware of that? Was there a sense that he knew that by setting in motion the dynamics that would lead to a peace agreement he stood a pretty good chance that the SDLP would be made irrelevant by a Sinn Fein that essentially bought into peaceful politics? FITZPATRICK: I think he was aware of it. And I think we also have to remember that John Hume’s view of politics, the political situation in Northern Ireland, is that he got involved in politics out of conviction that there should be a more inclusive, cooperative society. That’s why I used rather extensively those 1964 articles to show exactly where the fault lines lay and also exactly where he believed the end game was for Northern Ireland, where a better society could emerge from. So for Hume I think it was certainly difficult, I think for any politician it is difficult to see power leave one’s party and go to maybe a rival party. But at the same time, I think it was much more important the bigger prize for him was certainly peace. And, I mean, one of the last things he said as a serving politician, he was interviewed by The Irish Times, and he spoke about—he was asked about political leadership. And he said, well, political leadership is about changing the language of others, you know. I don’t think you’ll hear from John Hume political leadership is how you get the most votes and how your party beats the other party. It was much more the bigger game for John Hume. HAASS: Let me ask you one other question about Hume, which is, again, the film talks about it a bit, to what extent was he conscious and worried almost in the Martin Luther King sense that he was going to be the target of assassination? How much was that a conscious part of his day to day? And why don’t you think he was assassinated? What is your sense of why he survived the process, because he was a threat to the people on the fringe? FITZPATRICK: Well, he was conscious of the threats, bullet-proof windows. The scene is depicted there by Congressman Dougherty from the great Northeast in Philly who encountered his fair share of harassment as well for backing the Irish government and John Hume’s line on constitutional political approaches. So Hume’s family and Hume’s home was under a level of threat. Also, there was a propaganda war going on. I mean, the Sinn Fein has got a newspaper called An Phoblacht. And if you read some of the articles written, really horrible, disgusting things written about John Hume down the years, caricature versions of John Hume depicted as a traitor, as a person who, you know, is crawling off, that would have been the verb, crawling off to Westminster parliament and, you know, not as a patriotic Irishman abstentionist from Westminster. So certainly, the threat was there. But I also think the bravery exhibited by talking to the IRA and then talking to the leader of Sinn Fein, Gerry Adams, I think John Hume also very well understood that he was a necessary component for Sinn Fein to get into a political process and ultimately into peace negotiations in the 1990s. And I think that’s why they reached out to him. As I said before, he’s a conviction politician and he wanted peace, but the ask came originally from them. And they tried various experiments, putting a hood over his head, bringing him into to the middle of nowhere and demanding he, you know, accept certain conditions and he refused. The very fact that a man in captivity, let’s call it, was in a position to say no, I’m not going along with your charade, I mean, John Hume I think instinctively and intellectually really did understand the degree to which the IRA ultimately needed him and he also understood very well that he always topped the polls, the nationalist side of the fence, in Derry. He was the politician that delivered a great deal to his constituents. He was regarded with very high esteem as a constituency politician, quite apart from anything else, and that harming one hair of his head would have been politically very stupid. HAASS: I want to ask one more question about the past and then I want to turn to the present, George. One of the controversial decisions was President Clinton’s decision to invite Gerry Adams, it was talked about in the film, to come to the United States before the provisional IRA essentially renounced violence. What did you think at the time? And what should we have based—it turned out OK. It was a gamble, a gamble that essentially paid off. What was your thinking at the time? HAASS: They didn’t do it in Gaelic, right? MITCHELL: I was about as Irish as you are. (Laughter.) I really had no sense of it. But they were friends, they made sense, it seemed like the right thing to do, so I signed the letter. And that started me down a long road that ended up when I turned it over to you many years later. But I to say I do regard it as one of the most fortunate things to ever have happened in my life because I spent so much time in Ireland that I became aware of a heritage that I really didn’t know existed before. And I still think my father’s probably very happy up there that his son had a chance to do something he never had and that is to gain some appreciation of his Irish heritage. So I hadn’t thought about it, I didn’t know a lot about it when President Clinton asked me to go, and I went, I had never been to Northern Ireland before. So it was really, for me, an exploration. And it was extremely difficult. As you know, Richard, I chaired three separate sets of discussions over a span of five years. These guys are not easy to deal with. On the very first day of the negotiations, a great man who I didn’t really know at the time named David Ervine, who was a head of one of the loyalist parties, stood up and said—this is in the plenary session, so we had about 75 people in the room and it was a very formal setting—he said, Senator, if you are to be of any use to us, there’s one thing you must understand from the outset. I said, what is it? He said we in Northern Ireland would drive 100 miles out of our way to receive an insult. (Laughter.) I laughed, but I noticed that nobody else in the room was laughing. He was serious and it wasn’t funny and it’s true, so it set the tone. And anyway, it was a long process. Could I express a modest disagreement with Maurice here just to make for a lively discussion? MITCHELL: About John, I honestly don’t think John comprehended the extent to which the SDLP would be harmed by this, not that he wouldn’t have done it, he was a truly great man, totally passionate in the cause of peace by peaceful means. And to John, both were very important. And not that he might not have done it, I think he certainly would have proceeded, but I don’t think he comprehended the extent of it. While I think President Clinton’s explanation has something to it, it ignores this fact and the film doesn’t cover it. On the unionist side, Dr. Paisley had a late-in-life conversion. The peace process didn’t end with the peace agreement. One the day that I announced it, I said that the Good Friday Agreement does not guarantee peace, stability and reconciliation, it makes them possible and there will be difficult decisions ahead. And years later at St. Andrews, Dr. Paisley made a critical decision which effectively reversed 40 years of the policy of DUP and brought them in. So the explanation on the nationalist side might not be the same as on the unionist side. The timing and circumstances were such, probably much more complex than any of us know and have suggested. And finally, you can’t rule out that life is sometimes just unfair and not everybody who does good things gets credit for it. And that’s the reality. FITZPATRICK: If I could add briefly, Paisley and Hume had a very long relationship. They had been both in the original parliament in Northern Ireland. And if you read the speeches they both made in Belfast around that time, they really went at each other. Hume was very, very critical of the way Northern Ireland was being run, and the same was true also in British parliament, very virulent exchanges between them. But in Europe where they were also elected as MEPs, while, you know, Ian Paisley had his moments of drama in Europe, fundamentally they could cooperate extremely well, agricultural grants and inward investment into Northern Ireland. They both knew how to work with each other as well as be very critical of each other. And, yeah, it’s true that, of course, I don’t particularly focus on Ian Paisley’s later years. I mean, the film very suddenly ends in ’98. MITCHELL: Right, right, right, yeah. FITZPATRICK: But then my sole defense on that is I was telling John Hume’s story. MITCHELL: Yeah. But let me just say that they were able to work together, but they clearly didn’t care for each other. And I can say to you, direct, personal experience, both of them were very, very tough when they felt that their commandments were not being followed. Some of the most difficult, blunt, brutal sessions I had were with John and Seamus Mallon when they felt that I was taking the wrong course. And with Dr. Paisley, he regularly felt I was taking the wrong course, so I had many harsh sessions with him. And I’ll just close this little bit by saying you saw just a bit of Seamus Mallon in this film. John Hume was a truly great man, he was a visionary, he conceived this whole process. But John was not a detail man and he was not a negotiator, and Seamus Mallon led the negotiations with a terrific team from the SDLP—Mark Durkan, Sean Farren, and others. Seamus was one of the most brilliant legislators, negotiators, orators I ever met. And he’s another person I think hasn’t received overall the kind of credit that he deserved for the role that he played. And while he and John—there were some tensions between them, which might have emerged a little bit in the film, they complemented each other absolutely brilliantly. They had—their talents were different. They both were necessary. John’s, of course, was crucial to the entire process. HAASS: I know this is a history series, but before I open it up the members I just want to ask one question about the here we are, 20 years after the film, essentially, ends. The parliament in Stormont has not been able to meet now, I don’t know for how many months, probably closing in on a year give or take. You have a failure to implement the so-called Stormont House Agreement. There’s been virtually no progress on dealing with the legacy of the past. The question of flags and emblems and public displays has still not been sorted out. Questions of marching or parading are still a perennial source of friction. Probably, what, 90 percent of the kids in Northern Ireland go to a so-called—basically single tradition schools, integrated education and religious sense of the word integrated, is extraordinarily rare. Neighborhoods are still segregated to a large extent. The Orwellian peace walls continue to stand. And you mentioned the idea that John talked about creating a single society in Northern Ireland. Twenty years later, essentially has that failed? If he were here today would he judge what he had done as success? Would he judge it a failure, a work in progress, you know, the glass half-full, half-empty? How would he see things? And I guess it’s a question really for both of you, is there any chance that we ever go backwards? In a funny sort of way—not funny at all—is the legacy of John Hume that he created peace—a peace agreement if not—or did he create peace? Is there any going back? Or has Northern Ireland passed that possibility and the problem it faces now, however bad they are, in no way resemble the problems of the three decades of the troubles? What’s your reading on this? I’m curious, collectively, what’s your reading on the situation? HAASS: Just to be clear, the DUP was the only part that was pro-Brexit. Just to be clear. FITZPATRICK: And there are now kingmakers actually in the British parliament. So what—you’ve got the civic divisions which Dr. Haass has rightly pointed out. But you also have this division across the confederated United Kingdom, where people who—in Northern Ireland who voted to remain in the European Union are effectively being guided towards a Brexit reality. And many of—it’s very, very unknown and maybe unknowable exactly where that’s going on at the moment. So for John Hume, I think that would have been a terrible day. And as for the civic division, let’s call it, it’s also things are in a terrible pass where I think particularly in Belfast, areas which were mixed areas are now suddenly becoming—identifying more and more as loyalist areas and republican areas, again, completely against the principles that John Hume stood for all his political life. I mean, he would have always said, why cannot we get over our differences? The French and the Germans did. You know, use these models and models of the republic in the United States. What is all this about, that you can’t live together, intermarry, go to school together, and so forth? So he would—and the other last point you raised about whether—is the glass half-full or half-empty, I think as an active politician he would have said: My job here, sole role here, is to pick up the pieces, encourage the people to cooperate together. There is only one possibility here and that’s going forward. He would have—as discouraged as he may have been in private, he would have urged people to work together and negotiate new solutions. MITCHELL: Well, I’ll make two points, Richard, in response to it. First, before I went to Northern Ireland I spent a good bit of time in the Balkans. And I recall a visit there where I was taken to a town just below the border between Bosnia and Croatia. The town, before the conflict, was about half-Serb, half-Croat. The war began. The Serbs gained the initial advantage. The Serb militias came. The Serbs in town joined with them. And they defeated and expelled many of the Croats. And they burned most of the buildings in town that were owned by Croats. A year and a half later, the tide of war changed and the reverse occurred. So by the time I got there, just about every building in the town had been damaged. And as the mayor took us around I asked him: When do you think Serbs and Croats will be able to live together in peace again? He thought for a while, and then he said: We will repair our buildings and our bridges long before we repair our souls. The most important and hardest thing of all is to change what’s in people’s hearts and minds, and that takes a long time. Twenty years sounds like a long time, but if you regard the conflict as having begun 800 years ago when it really did begin, then 20 years isn’t really very long, is it? It takes a generation or two. It takes the passing of people who lost a husband, or daughter, or son in the conflict. I think it’s coming. I think John would take great pride in the accomplishments. He was such a passionate man and so devoted, he would figure out how to deal with this issue. And I’ll make one final point that’s a more general point. In every society, wherever on the earth, whatever the point of history, there are two political forces at work. You can call them Democrats or Republicans, Tories or Labour, you can give them any name you want. But they represent basically two internal social forces. One, resist change. Doesn’t want to upset the status quo. Wants to have life continue as they recall it through rose-colored glasses in their childhood and earlier. And the other wants change, largely because they don’t enjoy the status quo, didn’t have the same chance as others, and because they’re prepared to harness the forces of change to their benefit. And that was the source of conflict in Northern Ireland, will continue to be. It’s a source of conflict in our society. It’s a source of conflict in every society around the world. HAASS: The only—I hope you’re right. The only reason that I have more pause than I used to is because the lack of common experience and the inability to tackle history. I worry that generations will come of age who have not come to terms with the past. And they will romanticize distorted traditions. MITCHELL: Well, I should make one other point. Regression is always possible. No one can say that peace is permanent, peace is here to stay, that peace can’t fail. It could turn in a moment with some tragic event that mobilizes everybody’s tribal instincts. We have to do all the best we can to guard against that. FITZPATRICK: Tony Blair makes the point—oh, sorry. It was off—it was not used in the film in the end, but in an interview for the film he made the point that when he first encountered John Hume, he discovered in him a person who could go to almost any point in the political spectrum. He could talk to Ian Paisley and the Unionist. And he could talk to the British. And he could talk to Europeans and Americas. And he could gain great access in each of these politicians in those places. And the reason I reference that is because I think when one looks at the future of Northern Ireland and what is required, I think it’s really important that the role that London and Dublin plays as co-guarantors of the Good Friday Agreement continues. I think it’s very, very important that the United States continues to have a role of oversight. I’m delighted that we seem to have verbal affirmation that the tradition of envoys from the United States will continue. And I think it is a very volatile place. And it’s—historically has not really got there on its own because the problems of Northern Ireland were not created within Northern Ireland. So I will add to the senator’s point that, yes, I think they will get there but, yes, I think we will get there. It’s also our issue and it requires help and support from other parts. MITCHELL: Yeah. Well, one of the problems is they’re very self-critical. I go to Northern Ireland a lot, Richard. And every time I go there a reporter will say to me, well, look at these terrible things that are happening. Look at all this political division. Look at all this name calling. And I say, look, I just got here from the United States. (Laughter.) I say, why don’t you come over to the states and ask a few people there that question. We can’t hold them to a higher standard than the standard by which others live and engage in politics. Well, OK, we’ve gone on a bit long. I apologize. The moderator lost control here. (Laughter.) We’ve got a few minutes where we can squeeze in a couple of questions. It’s on the record. Raise your hand. Wait for a microphone. Let us know who you are. Be succinct. And there you have it. Q: First of all, thank you for this evening. And I’d like to thank you, George Mitchell, for your outstanding public services. And I’d like to ask you, did you learn any lessons in this conflict that you could apply to the conflict we now have in the Middle East, again, with allies that are in a verbal war and disagreement that is causing, I would say, problems for the security of Israel, for the security of the whole region? And I’m referring to the conflict now between Saudi Arabia and several countries and Qatar, both of whom we shouldn’t take sides for in this dispute. But do you have any ideas of how you could solve this problem, which is—could be a problem to the United States and to the whole region? MITCHELL: Yeah. I think that while there are superficial and, indeed, deeper similarities between many—among many of these conflicts, that the differences far outweigh the similarities. They involve—tend to involve religious differences, territorial differences, differences in national identity, all of them have an underlying economic factor. But just as each of the 7 ½ billion people on Earth is unique, so also, I think, are each of these conflicts. And while there are matters of process, attitude, approach that I think are transferable from one to another, the substantive issues themselves are unique and require a unique solution. About a year ago I spoke out in Queens to about 1,000 Irish-Americans—a couple years ago. And I said to them that I was about to say something that I never thought I would think, let alone say. And that is, I spent five long and very difficult years in Northern Ireland, after which I went to the Middle East. And after six months there, I felt that the Irish were a bunch of patsies, really easy to deal with—(laughter)—after spending six months with the Israelis and the Arabs. So they’re very different. Q: Then any lessons learned in the Arab conflict between Saudi Arabia and Qatar? Q: Any lessons that transfer? MITCHELL: Yeah, in his—in his book “1948,” the Israeli historian Benny Morris tells a story about when the United Nations proposed partition in 1947, and then—in late 1947, and in 1948 the Israelis accepted it, although there was a terrific internal struggle and the Arabs rejected it, because the Arabs believed that—there were only 600,000 Jews then in Israel, in what they called the Yishuv, the Jewish community, and the Arab populations totaled in the tens of millions. And there was—the Arabs believed that they could quickly overwhelm the Israelis, and there was great apprehension among the Israelis. And Prime Minister Ben-Gurion exuded confidence. And a reporter asked him why are you so confident. He said because we have a secret weapon. And the reporter said what is the secret weapon. He said the Arabs. (Laughter.) They were more interested in fighting among themselves than in forming a common front to fight against the Israelis, and that was true then, it’s true today. You can see it in the conflict that you just described. Whether that can be used in a way that brings about more stability in the region and agreement between Israelis and Palestinians—which I personally feel is possible and will happen, primarily because it’s so much in the self-interest of both societies. I don’t know when or how, but I believe it will happen because, as I said, the alternative for both is far worse than the political difficulties of getting to yes between them. That’s a whole ‘nother ritual. We’ll have to have another program for that. HAASS: Particularly since you and I don’t agree on that. Q: Bonnie Weir with Yale University. I think that there’s been a collective recognition that on the extreme green side and on the extreme orange side, that those parties are capturing—or have captured an increasing share of the vote from both traditions. So really all you see is sort of a polarized both society and institutions with the DUP and with Sinn Féin. To the extent now that it seems as if the UUP and SDLP are no longer viable political forces, at least for the time being, and the executive has collapsed—when society is so polarized along these ostensible sectarian divides and you have a system in which institutions run and ask parties to identify as either nationalist or unionist, do you think that that dampens the chances that there can be reconciliation at the civic level? HAASS: Can I ask before you say one thing? Analytically, one could give exactly the opposite analysis to the way you set it up. By that—by that I mean when the SDLP lost out to Sinn Féin and the UUP lost out to the DUP about 15, 16 years ago, a lot of us who actually thought that was good for peacemakers and meant the extremist parties had essentially moved towards the center of the spectrum. And we actually thought that, yes, the UUP and the SDLP were essentially marginalized politically, but the fact peace would ultimately be a lot stronger if the DUP and Sinn Féin embraced it, that Martin McGuinness and Gerry Adams or Ian Paisley had a degree of street creed, in an odd sort of way, that neither the SDLP or the UUP had. So—and I thought it was part of the evolution of the parties that had been outside the political space, had come into the political space. So I actually thought that was good, in many ways, for Northern Ireland. Q: And I would agree with you. I just think it’s not necessarily—I don’t think it’s necessarily very functional in terms of being democratic. HAASS: Well, that—yeah. And that I’m just sort of saying—again, I’ll turn to George and Maurice in a second—which is the entire political structure of Northern Ireland, in order to get us through your phase, was based upon certain identities. And the issue is—that’s actually a good question to end on—whether that basis for political process—indeed, for example, for majorities across these traditional lines—has run its course and we’d do better in Northern Ireland if you had parties like you had in the rest of Europe: social democrats and Christian democrats, whatever you want to call it, parties defined not by religious or ethnic or historical traditions but parties defined by ideology. Do we need to get to that point before we have the normalization of Northern Ireland? MITCHELL: I think that one of the most important factors remains the high level of segregation, and primarily the segregation in the system of education. Our American history tells us that the creation of the public school system served as the melting pot for the melting pots. I can tell you that’s true in my lifetime. I mentioned my father. My mother was an immigrant. She couldn’t read or write. And I went to public schools, and there were kids from everywhere there. And the whole emphasis was on American, being an American. I won’t go further on our own system now. But in Ireland, it’s—it remains an almost completely segregated school system. And every summer I support a program in Maine that brings kids over from both communities for two weeks, summer camp. They get along great. When they leave, the director of the camp asks them, all, would you please maintain your relations when you go home, and to a person they say we can’t. So they live separate lives. I think integration is going to come not because—and I support the integration program; I help raise money for it. But I think what it’s going to come is through economics. If you go into rural Northern Ireland now, you’ll find two schools in small towns, both of them half empty, or a third full. Sooner or later, the economics are going to drive them to one school. And it has to begin there, where they see others as part of the same community and more similar than the way they do now as much more different. And so I think anybody who wants to help the Northern Ireland, help encourage the integration of schools, help encourage people to interact at an earlier stage in life so they don’t enter adulthood formed in and become part of an entirely segregated system. HAASS: Maurice, you had the first word tonight and you get the last word, as is only fair to the man who made the film. What final thought do you want to leave the assembled with? FITZPATRICK: Well, I’m very grateful for that question and those comments. I think you walk into rural Northern Ireland and you see these two small schools and they’re half-populated, and you say to yourself, look, is this Gulliver Travels or something? Why aren’t they being educated together? And I think one of the answers is, we need political leaders who not only enable that to happen but don’t put down obstacles from permitting it to happen, which is what’s happening in the North right now. Irrespective of—to go back to your point, irrespective of party politics, I think what you have when you pick up the newspapers since Stormont has been suspended is a series of stories about, you know, the Cash for Ash scandal, or the Irish Language Act, or various things, and I think they’re all hollow. They’re all—they’re all red herrings, and Northern Ireland has a long history of great—very resourceful in producing red herrings. I think really what it comes down to is, you’ve got two people, two sets of people and parties with mandates, and they should do their jobs of negotiating sitting down and being assiduous in getting a deal and getting Stormont up and running again. In truth, I have my doubts that they really want Stormont back—for very different reasons—and I think that they are abdicating their responsibility by doing that. So, Dublin, London, Washington, I go back to the whole (Huguenot ?) formula. I think there should be a level of expectation and encouragement, strong encouragement to return to politics, because that’s where it’s going to return to eventually anyway.